Captivating views. Romantic sunsets. Ocean waves lapping the shore. The Pacific reaches out to the horizon, with the islands of Lanai and Molokai to the west. Mahana 705 is your inviting and thoughtfully equipped home-away-from-home designed to help you get the most out of your trip to Maui. Watch the humpback whales in winter and look for sea turtles year around. Ocean swimming, paddleboarding, surfing, kiteboarding, outrigger paddling and kayaking (equipment rentals available nearby). 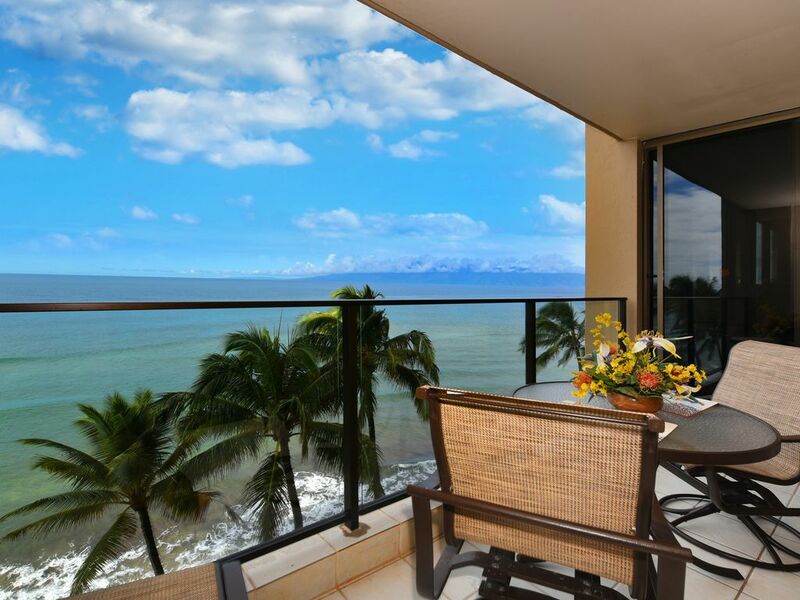 Or just relax on the oceanfront lanai of this idyllic condo. What's included in the condo? Charming Hawaiian style décor throughout the large bedroom and spacious living-dining area. Full kitchen and two full baths. A "Westin Heavenly King-Sized bed" new in 2016. Washer dryer in the condo, so you can travel light. Two Flat Screen TVs, a DVD player, and a stereo system. Free wifi. The kitchen is bright and 'user-friendly.' Equipped with everything (well, no turkey pan) you'll need for cooking, dining and drinking. Granite counter tops, stainless steel refrigerator, dishwasher, microwave and flat top range for easy clean-up. Also a drip coffee maker, coffee grinder, blender, toaster, and citrus juicer. A few spices are available for your use. The Mahana has the greatest gas barbecues by the pool for everyone's use - also a fun place to meet fellow travelers. Are you both getting ready at the same time? You will love the convenience of two full baths with over-sized rain-style shower heads, even hairdryers in both. The master has a curling and flat irons, too. Tommy Bahamas Beach Chairs, several sized coolers, for when you visit other beaches, umbrellas, and boogie boards. Good binoculars for watching the wildlife, and books describing all the activities, the history, Hawaiian drink making, the fish you'll see while snorkeling. It consists of two twelve-story buildings connected by a classic, lovely Hawaiian style entrance and lobby, with a beautiful stretch of sand and lawn in front. You can walk along the beach for miles, then return to the Mahana for a relaxing swim or soak in the ocean view hot tub. Parking is always free. A tennis court and an Oceanside shuffleboard court are there to enjoy. The Mahana attracts a relaxed group of travelers from all over the world, seeking a quality island experience in an authentic and beautifully Hawaiian setting. The Expedia desk in the lobby will organize any activity you wish, from a snorkel trip to a dinner cruise, zip-line to a kayak tour. There are shops, restaurants even a farmer's market in walking distance. Dukes Oceanfront Restaurant, located next door to the Mahana, on the beach, is ideal for breakfast, lunch, dinner and happy hour. Whaler's Village is a short distance (approximately 3 miles - you can walk to it along the beach boardwalk which starts at the Mahana). Lahaina and Kapalua are a few miles further - an easy drive for sightseeing and golf. Mahana 705 ~ an ideal location to enjoy all that Maui has to offer, or... to just do nothing at all. Let the beauty of Hawaii surround you, let the ocean waves gently lull you to sleep, and the tropical scents of ginger and hibiscus awaken. Your dreams of Hawaii start here. Contact us for the answers to any questions, and for the 10% returning guest discount. Let the spirit of aloha captivate you as it did us. How can one not fall in love with this beautiful setting. We have been returning to Kaanapali since 1979, and our once a year sojourn is always a joy with something new to discover. Get ready to relax and be rejuvenated! Maui does that! The view! The condo is near perfection. The beautiful beach walks, stunning sunsets, romantic rainbows and potent mai tais. We found it all here. The weather is about as perfect all year 'round as one could ask for. It is the BEST PLACE to watch the whales in winter. Maui never feels crowded, but due to its visitors, has great recreation and many fantastic restaurants and activities. On those days you want to do nothing, Mahana 705 is idyllic. Listen to the ocean as you relax on the lanai, at the pool, in the hot tub, on the beach. The ambience is always fun, but mellow. No cell phones on the beach here! Walk to the farmer's market for tropical fruit and flowers, and fresh fish for dinner. On the days when you desire a little more activity, it's a short walk to the best snorkeling park on the island, or a short drive over to Whaler's Village or Lahaina for some gifts for the folks at home or to go to a luau. It's a convenient spot from which to take a longer excursion out to Hana and the Seven Pools, or up to the top of the volcano for the sunrise and a little hike. The concierge at the Mahana will find you anthing from a dinner cruise to a kayak trip. There's always something new to discover, even after 30 years! Right on the beach. Look out over the Pacific and the islands of Lanai and Molokai in the distance. Enjoy inspiring sunsets year around. And be enchanted by the sounds of the ocean. 15 yards to the water! Breathtaking views from virtually every room. In winter, the whales will come to you! Watching their antics is thrilling. Year around, watch the sea turtles in the surf. Flat top range for easy clean up. Oceanfront. Belgian glass top with Hawaiian style base and chairs. You can also enjoy the Tropitone furniture on the lanai - a glass table and chairs for dining. Hawaiian lore, visitor tips, cookbooks and paperbacks for beach reading. Tommy Bahamas beach chairs, if you want to go beach hopping, different sized coolers, boogie boards. The Mahana provides plenty of lounge chairs both at the pool and also on the lawn overlooking the ocean. Native Hawaiian landscaping enhances the natural beauty. Kayaking and paddleboards available all around the area to rent. There are also lessons available, and group kayak tours. Boogie boards in condo. Easy to rent snorkeling gear. Paddleboards and kayaks are available to rent through a variety of companies. Tommy Bahamas beach chairs and coolers available in condo. Kaanapali and Kapalua offer many options for golf. Large ocean view hot tub adjacent to pool. Great spot to meet fellow travelers. A wonderful boardwalk runs from next to The Mahana all the way to Black Rock and beyond to Whaler's Village. Great for morning walks. You can also walk the beach the same distance. We have taken great care to try to think of everything a guest might need. There is a makeup mirror, flat iron and curling iron. Wine, champagne and brandy glasses. A great collection of books. We hope that you love Maui as much as we do! We had an awesome time at Karen's condo. She had everything for us that we could need and was very quick to respond to any questions. We loved sitting on the balcony and watching for marine life- we saw so many whales, totally unexpected!! We loved the complex and area as well. We got married on this trip and it was a perfect place to relax and enjoy the beauty of Maui. We hope to be back!! Sarah, Congratulations on your marriage! And we are so happy that you enjoyed your stay in our condo, and experienced the whale-watching too! We hope you'll return soon! Mahalo and Aloha. We chose this condo so we could fall asleep to the sound of the ocean. The unit it so close that the ocean ended up being too loud but it was worth it. The views from the bedroom, lanai and living room were perfect for spotting whales. There were so many, we lost count during the weeklong stay. The unit was clean and had everything we needed including binoculars for whale-watching. We only prepared breakfasts here so the kitchen supplies suited us fine. Karen was communicative and made some good local recommendations prior to our arrival. We had no issues with checking in or out. We would definitely rent this unit again. This was a great place. The condo was beautiful and the location was perfect. We watched the whales almost daily. Dukes was a short walk away. We will be back. We have stayed in many VRBO properties but this is the most well appointed/supplied unit we have ever visited. The view from the lanai is unbelievable with viewings of whales every day, pods of dolphins on a couple of occasions and multiple rainbows. Walking distance to a grocery store and bars/restaurants was a real plus. Karen is super quick to respond to any issues (only a couple of small things) and was a real pleasure to deal with. Best trip to Maui we have ever had!! My husband and I went to hawaii for our honeymoon! It was just wonderful! The condo was very clean and cozy! Having the sunset and multiple whale sightings from the deck was breathtaking. We can’t wait to go back!! Ziplines are nearby. The ocean is a marvelous place to try or perfect your stand-up paddle boarding or kayaking. You can also take outrigger trips with guides to go closer to the whales in winter. Haleakala Volcano National Park offers hiking and mountain biking, and amazing scenery both sunrise and sunset. It is simply an amazing place. Lahaina, an historic whaling town is great for getting a taste of Hawaiian dining, art and history. Filled with art galleries, jewelry shops and tourist shops. There's also lots of live music and great gelato. Upcountry, for a change of scenery from the beach offers exotic flowers, a lavender farm with many types of lavender and excellent lavender products, parasailing, and a fascinating artist community at Makawao. And if you like S-curves, don't miss the drive to Hana. Many waterfalls along the way. Rates are subject to change until reservation is confirmed. Reservation is fully refundable (except for VRBO's fee) if cancelled more than 30 days prior to arrival. In the event of later cancellation I DO MY UTMOST TO RE-BOOK the property and refund. We are happy to work with you! For stays longer than 14 days, there is an additional $80 cleaning fee, and housekeepers will do a linen/towel exchange during your stay. Check for additional housekeeping costs for longer stays. Last Minute Rates - if you can rent all the nights between existing reservations, or your booking is very short notice, call or email for reduced rates. Mahalo!